Philips MCI900 review | What Hi-Fi? Philips doesn't play it safe. In a time of global economic uncertainty, it's still pushing the envelope with high-tech, high style, high price electronics like this, the MCI900. Thing is, if you don't play it safe, you leave yourself open to failure – exactly as Philips has here. As well as a disc spinner, this micro stack contains a Class ‘D' digital amp outputting 50W per channel, and both wired and wireless network connections, for you to stream internet radio and your own files. The spec suggests it also contains a 160GB hard disk; not quite. Instead it comes with an external 160GB hard disk, which you connect to the USB socket on the back and can then use for storing digital tunes. It's small, but could it not be integrated for the sake of neatness? And on the subject of missed opportunities, if you've a product with a hard disk, an optical disc drive, and the ability to act as a media server, why not allow it to rip CDs? Then there's iPod compatibility: why not exploit the digital amp and USB connection to take digital signals from the most popular portable? 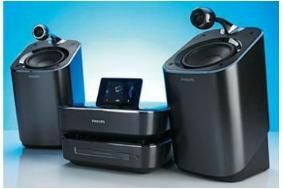 Perhaps these technical shortcomings are due to the seven years Philips says it spent developing the truly intriguing SoundSphere speakers. Here's the idea: the 25mm soft-dome tweeter is mounted in a single-piece aluminium enclosure, which is supported by a sonically inert arm to free it from vibrations and standing waves from the main cabinet. This is supposed to increase the dispersion of treble, making the sweet spot wider. The 5in woofer is angled to ensure good sound projection and time alignment with the tweeter.Sadly, whether you're playing a CD or a FLAC file, the sound the Philips produces is fluffy, dynamically flat and lacking in detail. Play Caitlin Rose's Shanghai Cigarettes, and although the delivery is airy and tonally even, it's vague to the point of dullness, robbing the track of its punch, directness and, crucially, its sense of fun. There's no sparkle to the treble, little bass definition, and no nuance in vocals. And don't go thinking this is a case of good speakers hamstrung by weak electronics. We tried partnering the SoundSpheres with a number of other systems, and although they sounded better, that overall staleness remained. One thing we haven't mentioned is that the MCI900 will also play DVDs and video files, which it can upscale to 1080p and pump out via HDMI. But if you're hoping for this feature to be the Philips' saving grace, you're going to be disappointed: the pictures are perfectly fine, but can easily be beaten for detail and vibrancy by a decent, budget, standalone movie-spinner, sealing this overpriced system's fate.